Time to take a breath, enjoy a cup of your favorite beverage, and reflect. This past week was pretty darn exciting here, with a Category 3 hurricane passing through, a trip to the Emergency Room (smashed my fingers in the garage door), and a two-day migraine. And lots of good stuff too: volunteering at the Humane Society Thrift, hanging out with my best friend/husband, watching HBO’s new series, Westworld, the Cubs are in the League Championship Series, and have you tried the Ghirardelli Dark Chocolate Spicy Caramel Squares? 1. Friends old and newer. Really, there’s nothing quite like them. Some of our new condo neighbors hosted a pre-hurricane party and we had amazing snacks, wine, and laughter. Now we have a shared experience, including the water and power going out, and we are friends. 2. Thrift store scores. This giraffe blouse for fifty cents, and oh boy I am going to wear the heck out of these Earl jeans, also on the fifty cent rack. 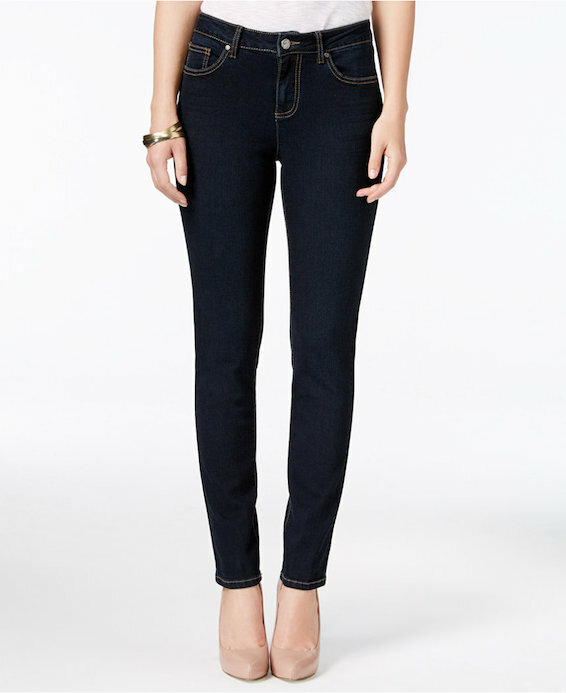 They fit like a dream and will be my go-to Fall and Winter jeans. Reminder: pay no attention to the size when thrifting. These “should” be too big, but got perfectly shrunk by the previous owner. My new-to-me Earl jeans look just like these, only without the nineteen year old model. 3.We hired a new customer service tech for our business, and I think he’s going to work out beautifully. Sandy will be freed up to do more software development, and to dote on me. 4. Sales and surprises in the online shops. I am looking for my four-five new Fall pieces, and the sales are fab. Reminder: Visible Monday starts Sunday around 5PM. Be there for the best blogger party and the finest style on the webz! Hope your fingers heal quickly. I love your positive, happy attitude towards life. I like both the giraffe blouse and the Earl Jeans – great catch! 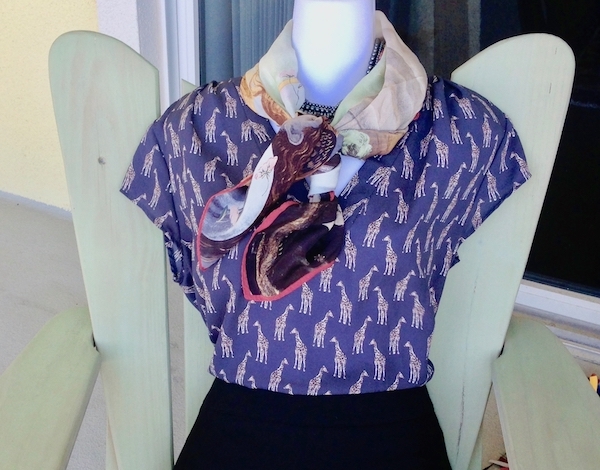 That giraffe blouse is sweet. Love it with that little neckerchief. Hoping I can find some great vintage things in NYC next week. I have your list of places to check out and my friend and I are excited to finally go. P.S. Time for doting is always good…isn’t it? Sounds like quite the week! I hope your finger is feeling better. My Dad almost lost his whole finger tip about a month ago doing the same thing. I adore your new giraffe shirt and jeans. We had a toonie sale here at the Salvation Army and I picked up a couple of Miss Fisher style dresses.